Custom chocolate takes the concept of unique gifts to another level. A gift recognizes an occasion, custom chocolate defines it. Likewise, a gift is a gesture, custom chocolate is a statement. 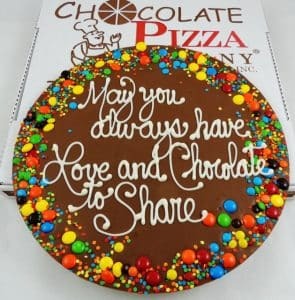 Customers that send custom chocolate are saying, “This was made just for you.” There are few confectionery mediums that can match Chocolate Pizza as a canvas for creating custom gems. 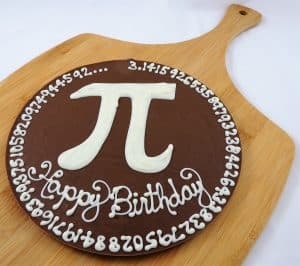 Custom work can be adding a name or years to a birthday or anniversary Chocolate Pizza. It might be a special message. Regardless, each script is done by hand. The spacing and fit of each letter is critical. A skilled hand is needed to execute that task. But that is precisely why a custom Chocolate Pizza is seen as such a special gift. Chocolate Pizza Company is near Syracuse, New York and is known for artisan-style workmanship. A Chocolate Pizza starts by blending the highest quality Swiss-style chocolate with homemade English toffee. A local recipe for the toffee dates back to 1919. Surprisingly, each batch of toffee is made on-site for freshness. Once the chocolate and toffee is mixed, it is poured into pizza pans. Chocolatiers then add delicious toppings like candies or nuts. There are dozens of varieties and each is served in a custom pizza box. Chocolate Pizza is a popular gift for business or personal occasions. The chief chocolatier in charge of production for Chocolate Pizza Company is also its most talented artisan. Jeannette is a magician with chocolate. 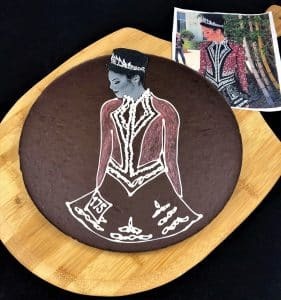 She creates beautiful Chocolate Pizzas that capture a client’s unique occasion. Chocolate is a particularly challenging craft. For starters, it must be tempered. Tempered chocolate means that its temperature was controlled during melting. The result is added strength, shine and smooth melting taste. But melted, tempered chocolate can only be worked with during a small time window so you work fast. Chocolate also adheres instantly when applied so a steady hand is essential. There are no mulligans when working with fine chocolate but Jeannette makes it look easy. Custom chocolate celebrates the best and biggest occasions in our life – like being world champion. For Orla Godley, world champion in Irish dance, Jeannette captured the image perfectly. Requests can go from elegant to whimsical. 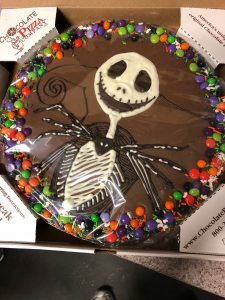 One customer asked for a Chocolate Pizza featuring the character Jack Skellington from “Nightmare Before Christmas.” Jeannette brought the character to life in chocolate. She applies those artisan talents to a variety of products including wedding favors. 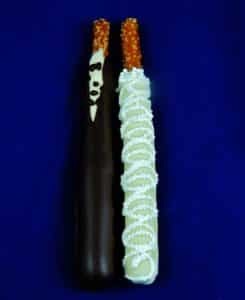 A bridal favorite is the “tux & gown.” Jeannette transforms 2 pretzel rods into a bride and groom pair that guests rave about. These are not mass produced. They are not shipped in from abroad but rather made one at a time here in America. The essence of custom chocolate is that artisans, not machines, write your message or create your image by hand. Chocolate Pizza Company has been featured by CNBC, Hallmark Channel, Food Network, and CMT. Forbes, People and Entrepreneur magazines have also shared Chocolate Pizza Company’s inspiring story. Owner, Ryan Novak, started with the business as a dishwasher when he was 15 years-old. He loved it and saw the potential to transform a small-town chocolate shop into a brand. In 2010, he was heading into his senior year at Syracuse University when he bought the business. He was 21 years-old. Today, that small chocolate shop has grown into Central New York’s largest chocolate maker. Its website receives orders from chocolate lovers on 6 continents. The retailers who carry Chocolate Pizza and Peanut Butter Wings say the products are customer favorites. It would be easy to stick to standard products. But it is more fun to create something from scratch. Chocolatiers create, design and interpret. They relish creativity. Artisans enjoy making something that is one-of-a-kind, something that people remember. A skilled chocolatier in-house gives small business an advantage over industry giants. Chocolate Pizza Company has one of the best.